Mid-walk through our neighborhood, I stopped and looked straight up into a magically-lighted canopy. 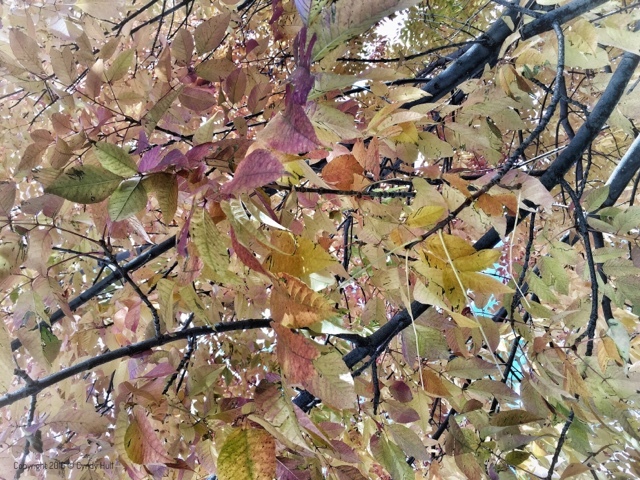 All along the block, this one particular type of tree displayed leaves shaded red on the topside and gold on the underside. As the sun filtered through the gently shifting layers, it cast a glow almost lavender. The Best Husband Ever gets a gold star for patience, since I stopped multiple times to gaze upward. Times like these, it works well that I'm a speedwalker and he's a stroller - he continues on, and I just catch up! I'm caught betwixt marveling at leaf mosaic and laughing OUT LOUD at your unexpected and politely eloquent ending! ah, the downside to this gazing and gaping in open-mouthed wonder!